So what do they mean specifically in a reading about matters of the heart? 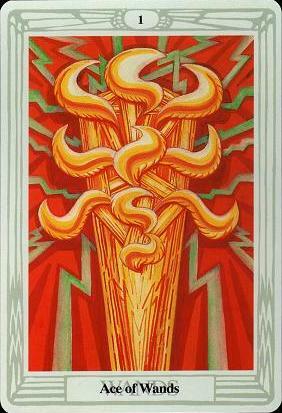 The Ace of Wands is a spark of passionate energy. This is the ultimate mojo card. If you get this card in a love reading, you can count on at least one person being powerfully attracted to the other. Charisma abounds. However, a spark is a thing of the moment. This is something that could fizzle and die if not acted on. Depending on surrounding cards or if it comes out reversed, it could be a superficial attraction, lacking in-depth and intimacy. 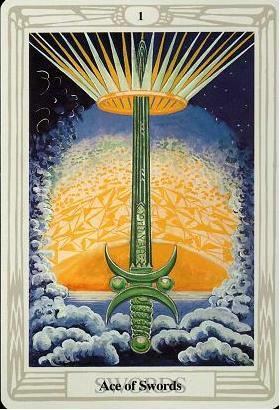 The Ace of Wands is the root of our very life force energy. Therefore it relates to sexual energy in both males and females but for obvious reasons it relates more to male virility and sexual health. A reversal could indicate impotence. Intimate moments signified by the Ace of Wands will be passionate and physically vigorous but may not always lead to a deepening of emotional bonds. They are about being in the moment. 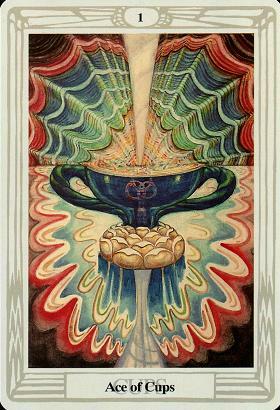 The Ace of Cups is often found in a reading at the start of a great new love relationship but it could simply meaning falling in love. For reciprocal love we want the 2 of Cups. 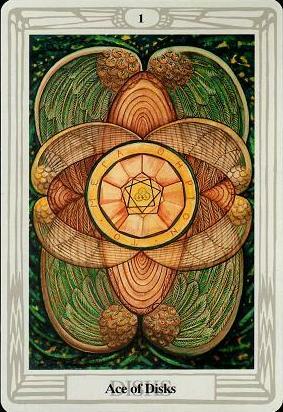 The highest aspect of this card is the gift of unconditional love, which is a chance for the divine to shine through us. Reversed or ill dignified, it can indicate withholding affection or devotion. This is also a symbol of conception, heralding a pregnancy, especially together with The Empress or The Sun. When the Ace of Swords shows up in a relationship reading for a potential date, you can expect stimulating conversation and being introduced to new concepts and ideas. If it shows up in a reading for an existing relationship, there is a chance to change the way you communicate for the better. It could also mean that someone is thinking about the relationship in a new and different way. Reversed or ill dignified it signifies break-downs in communication or withholding of affection the form of words. It can even mean that someone is mean and sharp-tongued. In intimate situations, the Ace of Swords could mean using language to arouse each other or deciding to try something new and experimental. The Ace of Pentacles could signify a posh date with luxurious surroundings. You could be drawn to someone because of their status in society, their power or their money. In a reading for an existing relationship, it could mean a new focus where you decide to work toward financial success or to start a fitness regime. Reversed or ill dignified, this Ace can symbolise an obsession with the physical and material side of the relationship. One or both of you could be more concerned with appearances than with depth of emotion. In an intimate setting, the Ace of Pentacle signifies a focus on achieving climax or surrendering to animal instincts.